Human Rights Watch (HRW) has called on Saudi Arabia to provide indications on the whereabouts of a Saudi-Qatari citizen deported from Kuwait to the kingdom last month. 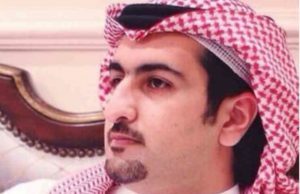 Nawaf Al Rasheed, a Saudi-Qatari dual citizen has been missing since his deportation by Kuwait at the request of Saudi authorities. Al Rasheed, son of late Prince Talal Bin Abdulaziz Al Rasheed, was arrested on his way back to Qatar after attending a poetry event in Kuwait. HRW has requested details on Al Rasheed’s current location. The Prince, who has been living in Qatar for four years, attending Qatar University, is not reportedly engaged in any political activism. In addition, Alkarama, an organization defining itself as tasked to combat injustice in the Arab World Since 2004, notes that Al Rasheed may be perceived as a threat by Saudi authorities. His family that ruled what is present-day Saudi Arabia until 1921 has a historic rivalry with the current ruling family – the House of Al Saud. Late last month, the UN also urged Saudi Arabia to provide information about the fate of al Rasheed. “We call upon the Saudi authorities to immediately announce the whereabouts of Al-Rasheed, whether he is detained or not, and the charges against him, if any,” said the spokesperson for the UN High Commissioner for Human Rights Liz Throssell. Al Rasheed’s arrest came amid diplomatic row between Qatar on the hand and Saudi Arabia, United Arab Emirates (UAE), Bahrain and Egypt on the other. Saudi Arabia and its allies have since June 5 last year severed ties with Qatar over its alleged support for terrorism. The Saudi kingdom under the leadership of Crown Prince Mohamed bin Salman has launched a crackdown on dissents. The campaign launched in September 2017 targeted dozens of scholars, clerics, public figures as well as activists. Analysts argue the crackdown was meant to bolster the young Crown Prince’s grip on power.